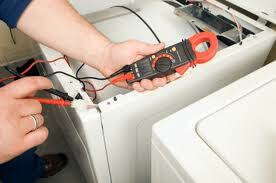 Finding a reliable dryer technician in Teaneck, New Jersey, is of a great importance. Of course, you may think that your unit is working smoothly. But it doesn’t mean it won’t develop any problem during its lifespan. As such breakages can be more than stressful, you will surely need someone to fix your front or top load dryer as soon as possible. And that’s where our company can be of help! By calling us, you will be able to have a trusted specialist at your doorstep the same or next day at the latest. By being trained to perform various dryer repair services, the pro will handle yours with little effort! Aside from the obvious failure to start, there are many symptoms that signal it’s time for dryer service. As some issues may seem to be quite simple, you may feel tempted to address them yourself. However, taking this course of action isn’t always a good idea! The thing is that a faulty dryer is a potentially dangerous piece of machinery. Thus, its servicing requires nothing but a proper level of expertise. If you are not familiar with the inner workings of your top load unit or front load washer and dryer, it’s all the better if you leave the job to our company. Not only will we provide you with a highly qualified Teaneck dryer pro but also do it at the earliest date. You will see that hiring Appliance Repair Teaneck is the easiest way to get your dryer back to normal without taking unnecessary risks. Thinking of a new gas or electric dryer installation? Give us a ring! Regardless of how dependable your current make and model is, you will still have to start considering dryer installation at some point. If you want to get the utmost results, do the right thing and entrust this job to our company. As we partner with numerous skilled installers, it won’t take us long to appoint one of them to your place. Whether it’s about an electric or gas type, you can expect the dryer technician to fit it safely and effectively. Moreover, you can always turn to us for routine maintenance in order to protect your appliance from untimely breakdowns. Whatever the case is, we are ready to dispatch the most experienced dryer technician of Teaneck upon request!